Developed by a professional civil engineer. A method for confining and integrating stone and aggregate particles into a solid load supporting mass. Stone and aggregate particles are placed within a collection of open, thin-walled cylinders. The thin-walled cylinders are created by removing both sidewalls from a waste auto tires. 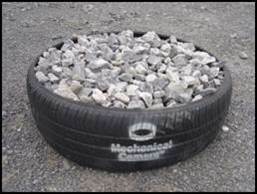 Tire-derived-cylinders are now available any where in the USA. The resulting integrated stone mass can be used as a public or industrial road base or foundation. The product is trademarked as Mechanical Concrete®. Stone filled cylinders can also be stacked to construct bearing and retaining walls. Collections can also be used for erosion control and to stabilize soft soils and sands. It is virtually indestructible in highway and heavy construction uses. The product is fully demonstrated and lab and field tested with completed projects in WV, CA, AZ, OH, & TX. It is faster, uses less material, less expensive, requires less maintenance and is stronger than conventional stone construction. It is approved for project use by the WV Division of Highways. US and Canadian patents. For a full overview please visit, www.mechanicalconcrete.com.